Home Travel The Secrets of Sri Lanka Unfolded! Here’s a question. What do you get when you combine 1400 km worth of golden sands, 8 world heritage sites, wonderful island weather all year round, jungles teeming with wildlife and friendly easy-going people on a tear drop shaped landmass in the Indian Ocean? The answer as Sri Lanka Tourism will tell you is a short flight further south from Chennai. Sri Lanka has so much to offer and it is so easy to reach that it would be foolish not to make use of this close-at-hand opportunity. Some of what you can do we discuss below, the rest we leave up to discover for yourself. The Kandy Esala Perahera has earned its place amongst the notable religious processions of the world. For a number of reasons. Also known as The Festival of the Tooth, it involves a celebration with performers in elaborate traditional costumes and began in the 4th century AD. It has had an unbroken run in every August since 1754. Many other local dances like fire, whip and Kandyan dances are also displayed during the procession. Nearly 200 elephants decked up in finery also participate in the procession making more than a jumbo impact. As mentioned earlier, with 8 World Heritage sites, Sri Lanka has more than its fair share of ancient temples worth a visit. 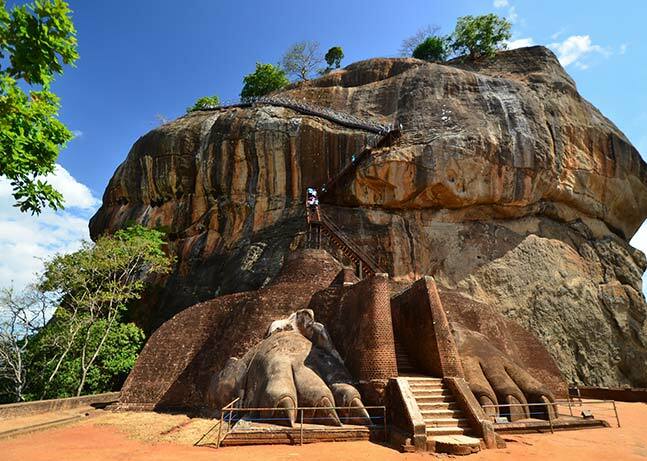 The Sigiriya in the Central Province has achieved worldwide fame as a 5th century rock cut structure with very artistic frescoes. The Sri Dalada Maligawa temple in Kandy, part of the larger royal palace structure, is one of the declared World Heritage site and well worth a visit. So is the mysterious Cave Temple of Dambulla, a network of about 80 caves, with carvings and paintings depicting the life story of Lord Buddha. Sri Lanka has been blessed with nature’s bounty as ample rainfall and sunshine make for a lush green paradise sure to be loved by every nature lover. The highlands of Sri Lanka house dense rain forests and tranquil tea gardens for people looking to get away from it all. Yala National Park, in a different dry semi-arid climactic region, is famous for its high leopard density, elephants and bird variety. A host of awe inspiring waterfalls like the Bambarakanda, Ramboda Falls, Baker’s Falls and Ravana Falls can be found around the island. With rising mountains, green forests and paddy fields, every location has a special charm. No matter where your Sri Lanka package takes you, chances are you’d be wowed. An island nation wouldn’t be an island nation without a beach life, isn’t it? Well, Sri Lanka can serve you the good (beach) life in spades. Do you want to lie around doing nothing or push your limits windsurfing and scuba diving? Any which way Sri Lanka has you covered. Tangalla, Unawatuna and Bentota are notable ones in the south if you are looking for your corner of paradise. The Galle Face Green is where you want to head to if your aim is to check how happening an urban beach can be. Or you could head out to Uppuveli beach, a beach which was long inaccessible but now finally available to the select few who choose to stay off the beaten path. Wait… but we haven’t discussed the hot air ballooning, hiking & trekking, rock climbing, whale watching, deep sea fishing that this incredible island offers yet. What’s more to say? Check out the options at Sri Lanka packages and make your choice. Next articleKerala – God’s Own Country!